Ballantine Books, US, 2010. Hardcover. Book Condition: Near Fine. Dust Jacket Condition: Very Good. 1st Edition. Signed, lined with a quote from the book and dated 1st US hb edn. See also my SLD copy of "All Clear". Light shelf wear. 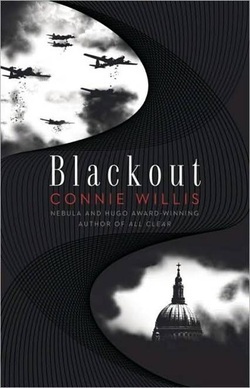 Synopsis : Blackout is the opening movement of a vast, absorbing two-volume novel that may well prove to be Connie Willis¿s masterpiece. Like her multi-award winning The Doomsday Book, this marvellous work marries the intricate mechanics of time travel to the gritty ¿ and dangerous ¿ realities of actual human history. The narrative opens in Oxford, England in 2060, where a trio of time travelling scholars prepares to depart for various corners of the Second World War. Their mission: to observe, from a ¿safe¿ vantage point, the day-to-day nature of life during a critical historical moment, As the action ranges from the evacuation of Dunkirk to the manor houses of rural England to the quotidian horrors of London during the Blitz, the objective nature of their roles gradually changes. Cut off from the safety net of the future and caught up in the ¿chaotic system¿ that is history, they are forced to participate, in unexpected ways, in the defining events of the era. Oxford in 2060 is a chaotic place, with scores of time-travelling historians being sent into the past. Michael Davies is prepping to go to Pearl Harbour. Merope Ward is coping with a bunch of bratty 1940 evacuees and trying to talk her thesis adviser into letting her go to VE-Day. Polly Churchill¿s next assignment will be as a shop-girl in the middle of London¿s Blitz. But now the time-travel lab is suddenly cancelling assignments and switching around everyone¿s schedules. And when Michael, Merope, and Polly finally get to World War II, things just get worse. For there they face air raids, blackouts, and dive-bombing Stukas ¿ to say nothing of a growing feeling that not only their assignments but the war and history itself are spiralling out of control. Because suddenly the once-reliable mechanisms of time travel are showing significant glitches, and our heroes are beginning to question their most firmly held belief: that no historian can possibly change the past. Blackout is an ingeniously constructed time travel novel and a grand entertainment. More than that, it is a moving, exquisitely detailed portrait of a world under siege, a world dominated by chaos, uncertainty, and the threat of imminent extinction. It is the rare sort of book that transcends the limits of genre, offering pleasure, insight, and illumination on virtually every page. Signed by Author(s). NOTE - I have triple-signed (very rare) copies of "Fire Watch", the novella that started this amazing series. Please check out my other titles.